I started by binding the tassel neck with a thin black cord. Then after I finished the black version with a beaded tassel neck I decided that the grey version needed more "bling". To contrast with the randomly beaded neck, plus because I had already put an orderly black whipping on the grey tassel neck, I decided an orderly, lightly beaded design was the way to go. 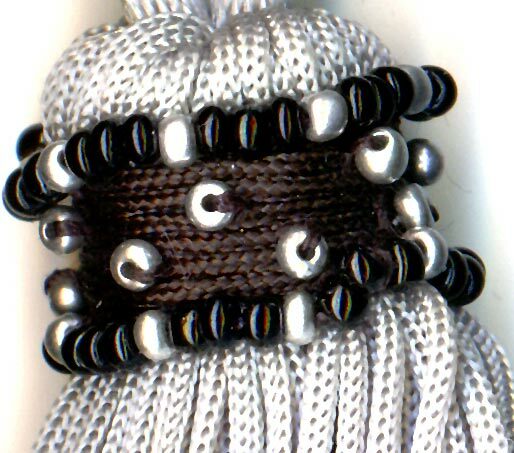 Starting with a round of beads (3 black, 1 silver) around the top and bottom of the existing whipping, I also added a smattering of silver beads to the whipping itself.